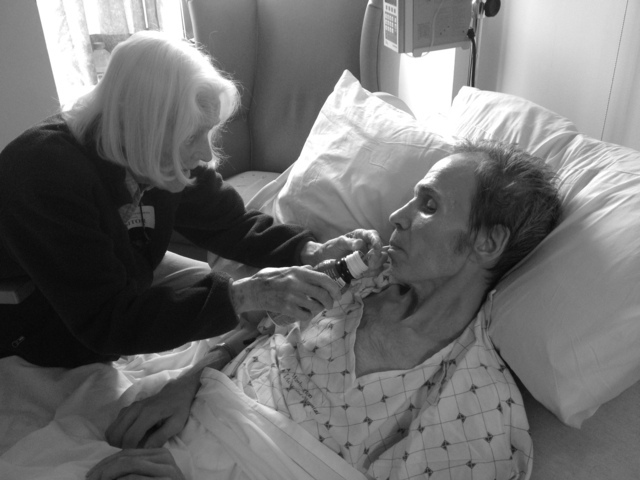 My mother feeds Henry a nutrition drink on her last visit to the nursing home where he spent his final months. This piece concluded a months long, multi-author series examining end-of-life issues. By the time he died last year, at 58, my brother Henry had been bedridden for more than two months. He could move his arms and hands, but only slightly, and he could turn his head from center to right. That was it. He was, in nursing lingo, a “total-care” patient. He needed to be diapered and turned, fed by hand and have a cup or straw raised to his lips to drink. He was a living skeleton—skin on bone—and bedsores were appearing on his ankles, back, heels and hips. A long-standing sore on his tailbone had broken open, revealing a huge, hideous cavern that required weekly visits to a wound clinic. Still, it was not easy to let him go, and harder still to decipher his wishes. Henry was born with mild developmental delays. Five years older than I, he was strong, eager, kind and often hilarious. We grew up together on a small farm in Maryland, where we kept each other company swimming and fishing in the pond, playing kickball and board games, racing bikes and tending the chickens, cattle and horses. With support, he graduated high school, learned to drive, held a job. I went away to college. He got a girlfriend. We wrote and talked often. Then, in his 20s, he suffered a psychotic episode and began a long, slow slide into mental illness. There were years of mania, years of depression, years of wandering off. The old, endearing Henry was still there, but more and more frequently he muttered, yelled, kicked things, rambled on in a random stream of consciousness and obsessed over his wallet, his cigarettes, his lighter. His physical health declined as well. He stooped, his knees were permanently bent and he had trouble with balance. In his final years, he often could not hold a thought long enough to finish a sentence or bring a fork to his mouth. His doctors had no answers. We were told he had dementia. CT scans showed only that his brain was shrinking, but not why. And the treatment seemed always to be the same: more drugs, different drugs—each with its own side effects—until it was impossible to tell what was the illness and what was the medication. Yet, absurd as it seems now, it never occurred to any of us that we might one day be making end-of-life decisions for him. Henry was living in Maryland, in a group home near our parents. He had been supported for more than 30 years by an agency that serves adults with intellectual disabilities, and over time we had left more and more of his care to them. He visited the farm for holidays and occasional weekends and joined us in New England for Christmas. But the agency arranged his days, oversaw his medical and psychiatric treatment and housed him in a series of community residences, each more heavily staffed than the last as his illness progressed. They recommended he remain his own guardian. We had no health-care proxy, no medical power of attorney, no living will in place. In retrospect, there were so many questions we should have asked. By the time he entered the hospital last spring, Henry was receiving one-on-one care virtually around the clock. Alone in the hospital, he was agitated, calling out constantly, requiring sedation for every procedure. His aides visited once or twice a day, which helped, but when he was released to a nursing home, the funding ended. We were told there would be no more direct care for at least three months. And so I, in western Massachusetts, and our older sister, in New York state, began a tag-team marathon of on-site support and advocacy that lasted until Henry’s death two months later. Calls to doctors and therapists, lessons for the nursing-home staff in “Henry-speak,” trips to the drug store for nutritional drinks and Gatorade, trips to his residence for clean clothing and trips to the farm for a radio, an iPod, anything that might calm him. Our father had died three years earlier, and our mother, who was just turning 90, couldn’t manage the drive or Henry’s behavior. To our surprise, Henry settled fairly happily into the nursing home. The aides caught on quickly to his quirks and developed an affectionately joking rapport with him. They knew to keep his yellow socks visible and his ID bracelet positioned just so—his only touchstones in a shrinking world. Henry’s trips to the hospital, however, were a different story. He needed to return regularly to have his bedsore debrided and was admitted to the emergency room several times for an unexplained fever. Somehow, it seemed, he was always being sent off when we weren’t around. The ambulance rides frightened and upset him. At the hospital, he never knew exactly what was happening or why. He lay helpless in an unfamiliar room, poked and prodded by strangers, unable to communicate his most basic needs until one of us arrived. During Henry’s last, torturous hospitalization, I finally convinced a new neurologist to re-examine his case. The doctor studied photos of Henry from throughout his life, put him through a series of simple exercises (all of which he failed) and looked at the disc of his most recent CT scan, which I had retrieved from the original hospital. There were still no answers, but there was a conclusion: Henry would not get better. His was a degenerative condition, possibly Parkinson’s, that had been progressing for decades. Something changed for me then. Maybe I gave myself permission to let Henry go. Maybe I gave him permission. Maybe I realized that all the tests and treatments he’d been enduring were for naught, that they were more for our sake than his. Throughout it all, Henry had been clear about one thing: he did not want to be in the hospital. So that’s the decision we made: no matter what happened, he would not return. We were only able to execute it through a last-minute paper scramble, thanks to a compassionate notary public, and the support of his nursing home doctor. We did not talk with him about death. Maybe we should have. But it was hard to imagine that being productive. Those last weeks held some of the nicest moments I’d shared with Henry in a long time. There was no more shouting or kicking. He lay curled quietly in bed, his clothes traded for a hospital gown, his voice a halting whisper. We listened to music from our childhood on a classic rock station as the nursing home aides came and went, shifting his bird-thin legs from one side to another. I fed him his meals and offered him sips of water. Occasionally I held his hand or stroked his arm until he told me to stop; even that small amount of stimulation often seemed too much. I discovered that while Henry could no longer initiate movement, he could sometimes still respond reflexively. When I said goodbye to him for what turned out to be the last time, I told him I loved him, kissed the bones of his sunken cheek and turned my own cheek to his lips. He kissed me back for the first time in years. When the end came a few days later, it was mercifully quick, and as mysterious as everything else about Henry’s life. He was simply unable to breathe one night. The nurses rushed in and gave him oxygen. They asked if he was in pain, and he said no. The doctor told them not to call an ambulance and ordered morphine. Before it could be released from the nursing home pharmacy, he was gone. For years I had imagined that when Henry died an autopsy would reveal, at last, the cause of his disabilities and his long decline. It was something I had always planned on. But when the time came, I couldn’t bear to put his battered body through one more procedure. There would never be answers, and somehow, it no longer mattered. Henry was just Henry. And he was at peace.